I’m not one for making new year resolutions but I have decided that I need to eat healthier this year. As a busy work-at-home mom, I easily fall into the rut of fast food and unhealthy snacks rather than healthy and well-balanced meals. So at the start of this year I picked up some romaine lettuce…then it sat in the fridge. It patiently waited to be turned into a healthy meal until one day I decided to mix it with some of the other ingredients I had in the fridge. 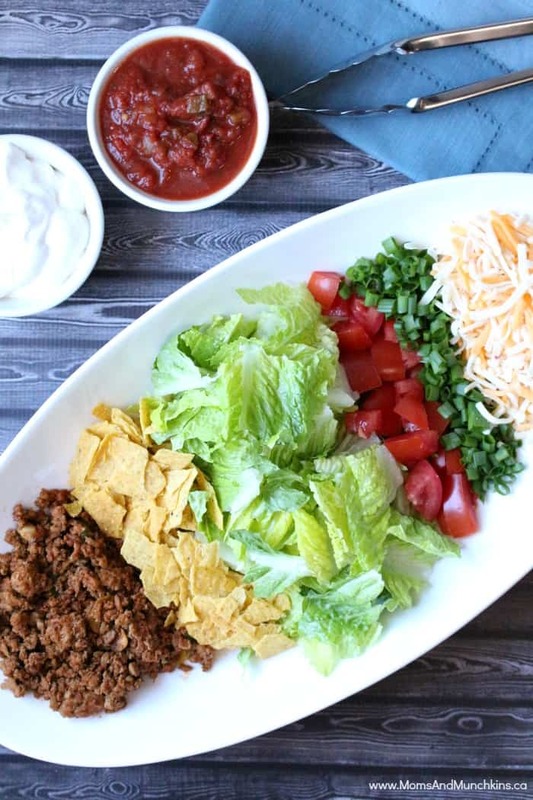 The result was this delicious taco salad recipe packed with healthy greens, vegetables, extra lean ground beef and more. This salad is packed with so many delicious ingredients that it is actually a meal and not just a starter dish. You can adjust the recipe based on your tastes. If you like spice, try using a spicy taco seasoning in the taco beef along with a few sliced hot peppers and a spicy ranch dressing. If you prefer something mild, try the mild taco seasoning with sour cream and mild salsa as dressing. A salad packed full of so many delicious ingredients that it makes a filling meal. Adjust the quantities of ingredients based on your tastes and the portion sizes you'd like to make. Cook & season chicken according to the directions on the taco seasoning package. Wash lettuce and shake off excess water. Place lettuce in individual serving bowls. Top with cooked seasoned beef. Top with sliced green onions and diced tomatoes (could also add sliced black olives and sliced hot peppers). Top with a scoop of salsa and a scoop of sour cream. Sprinkled shredded cheese and crushed taco chips on top. This salad is really easy to make. In fact, you could cook a big batch of seasoned taco beef and store it in a container in the fridge so you could make additional salads throughout the week. One of the easiest ways to eat healthy is to have a variety of healthy prepared foods & ready to eat in your fridge. 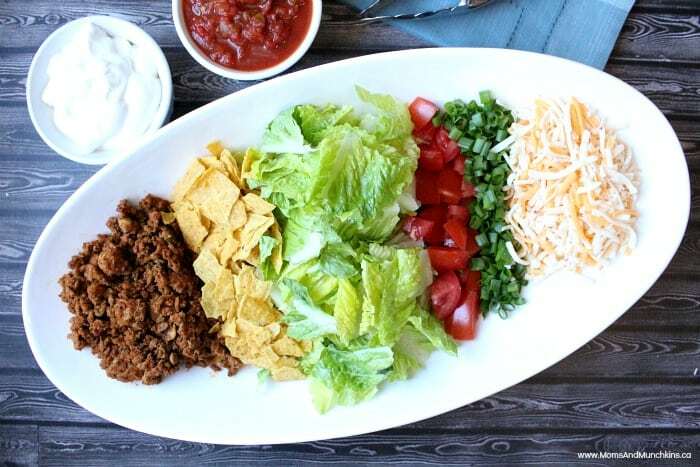 I love taco salad and yours looks so pretty laid out like that!